Hair loss is no longer a permanent problem! Permanent makeup for bald head patches is a treatment that essentially recreates missing hair strands, resulting in a natural, complete finish. Men and women who are afflicted with bald patches on their heads are ideal candidates for permanent makeup application. The procedure can mean the difference between a lifetime of hat-wearing and the freedom to walk around with an uninhibited scalp. While many men choose to embrace their baldness, others - especially young men who find they are experiencing an early onset of hair loss - may wish to do something about it. The procedure is also beneficial to men who have undergone hair transplants but seek to enhance their look further. Similarly, women experiencing female pattern baldness might seek alternative options to medication, wigs, transplants or hairpieces. In such cases, permanent makeup for bald heads is a choice worth considering. Cancer patients who have suffered hair loss due to chemotherapy may also benefit from permanent makeup for baldness. Allergic reactions may occur. Though reactions to permanent makeup (also known as micropigmentation) are widely considered rare and unlikely, they still remain a strong factor in the decision-making process. Sensitive-skinned individuals are advised to consult with a dermatologist before undergoing any procedures. Scars are also a potential problem involved with permanent makeup application. Individuals prone to keloids, or scars that tend to grow beyond their normal boundaries, are particularly susceptible to scarring. Removal of permanent makeup is extremely tricky. Despite the many advances in medical technology, the removal process has not yet been perfected. Many removal options are available, but the cost and potential pain associated with each can be exponential. Permanent makeup for the head is also known as scalp camouflage or hair follicle simulation. During this process, a skilled and licensed technician essentially recreates missing hair strands, thereby filling the area with "hair" and creating a natural look. Hair Follicle Simulation: Recommended for small patches, this procedure is especially beneficial to individuals with thinning hair. Hair follicle simulation may last for as many as ten sessions or as few as two. Head Shading: This procedure is an ideal option for individuals who may have developed scarring as a result of head surgery, or simply for bald spots. Head shading sessions generally are complete within two to three visits. Hair Stimulation: Though not exactly a form of permanent makeup application, hair stimulation (not to be confused with the hair follicle simulation practice) is the process of running tiny needles over the scalp and stimulating the scalp. The desired outcome is enough stimulation to encourage hair growth, however small or large an amount. Don't Forget These Important Tips! Permanent makeup is not necessarily irreversible, but the process of removing it can be extremely difficult. 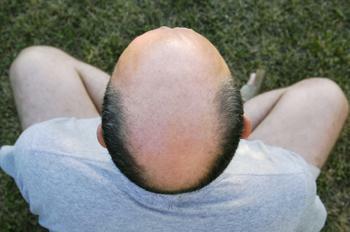 With this in mind, it is important to go over these final tips before making the decision to have bald spots covered. Check references with the American Academy of Micropigmentation and the Society of Permanent Cosmetic Professionals. These organizations help provide credentials to professionals and are an ideal source for honest, forthright feedback. You may also consider contacting individuals who have undergone treatment from the facility you are visiting. Don't be afraid to speak up and ask questions of your permanent makeup artist. Inquire about his or her professional experience, training level and history in performing the bald head coverage procedure. Also, ensure that you understand the process by learning about the tools and equipment used during the procedure. Bring a photograph depicting your desired result to the consultation. This will give the treatment provider a visual understanding of your needs, and he or she will be able to guide you toward the most appropriate form of treatment. Ask to view before and after photographs of clients who have received similar treatments. Ensure that you are aware of all possible side effects and complications that might arise, as well as treatments for them. Learn about any aftercare procedures you may need to adhere to, and understand your responsibility in keeping up with them.